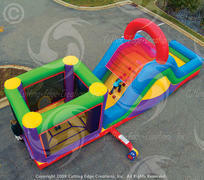 The Inflatable Toddler Playgrounds are best for children ages 1 though age 6. Toddler units are great to add to any event that might have those little guys/gals at that might be intimidated by a larger bounce house and just are not ready to transition into that quite yet. 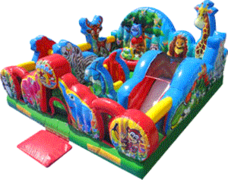 The toddler units are expecially great also to add to an event where you will have mixed age groups attending as this gives you an exclusive item that if for the youngest attendees which parents will love. This also free's up your lines on some of the bounce houses where you would otherwise have to really split up your groups waiting so you are putting same size children in at one time. 3 Monkeys is fully insured for a worry free Entertainment Rental Experience! Call us at 717-650-7657 or 410-581-5867 or CLICK HERE to reserve your rental by date now!